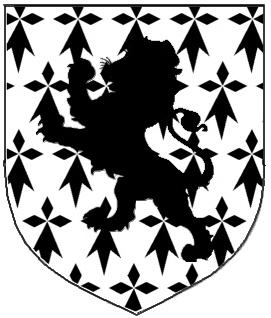 Coat of Arms: An ermine shield with a black lion rampant. WYVERN: The word Wyvern is an alteration of Middle English "wyvere" for viper, it is also from Old North French wivre, and a modification of Latin vipera. 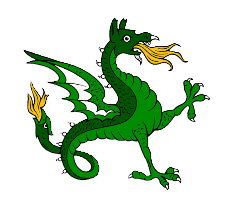 A mythical beast usually represented as a 2-legged winged creature similar to a dragon (much like a cockatrice but with the head of a dragon) and with wings and a barbed serpent tail. Ermine. A little animal about the size of a squirrel, and borne by several families as their Crest. 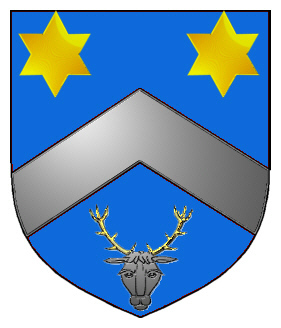 Coat of Arms: A blue shield with a silver chevron between two gold mullets in chief, and in base a silver buck's head cabossed, attired gold. Chevron. One of the honourable ordinaries, and occupies one third of the field. Mullet. Supposed to be the rowel of a spur, should consist of five points. 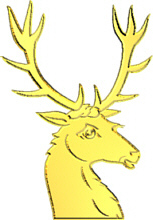 When of more than five points should be blazoned a Star of six, eight, or more points, the number being named. Chief. From the French Chef. 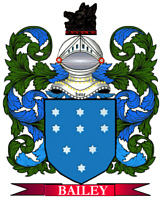 Which means the head or uppermost position of the shield.